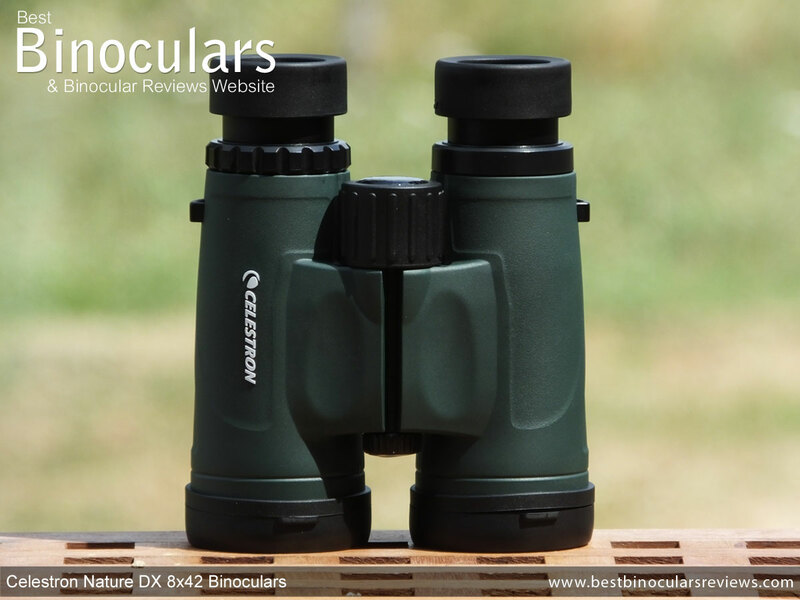 With the Nature DX series, Celestron state that their aim was to produce a good quality, yet affordable binocular specifically aimed at new and intermediate users, but one that still retained as many higher end features as possible to deliver a superior view within this class. 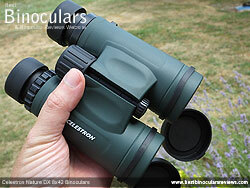 Costing less than $150 / £150, they are positioned just above what I will refer to as the "standard" Celestron Nature binoculars (see my Celestron Nature 8x42 Binoculars Review), yet they have a number of improvements added to them, which means based on the number of requests I get from readers looking for "good quality" low cost binoculars, these Nature DX's have the potential to appeal to a huge audience. These 8x42 Nature DX's have a fairly traditional roof prism design, with a single hinge located on the centrally placed bridge that connects the two barrels, behind which sits the focus wheel. The main frame on the 8x42 Nature DX is constructed from polycarbonate, which is fairly typical in this price range as it is a relatively low cost but strong, durable and lightweight material. Higher spec bins will often use aluminium or even magnesium to make the chassis, both of which are more expensive to make and usually a little heavier, but are also stronger. Almost the entire exterior is covered in a dark green rubber armour, which is fairly thin and on the hard side when compared to most others. This probably means that it provides a little less impact protection and because of the hardness, is not quite as tacky than some with softer rubber and so the surface is a little less grippy. To help with this a little, Celestron have lightly textured the main sections of the barrels that you hold onto. Apart from protection and grip, this surface is also far less reflective and will dampen any sounds than those with exposed metal or plastic, which depending on the situation can be an important consideration as you have less chance of giving your position away and/or chasing away easily startled wildlife. Another very small detail which I have not seen on many other binoculars, but one that I really like are the fore-finger indents located on the top of the body, on each side of the central hinge. Also, instead of the thumb indents that a found on the vast majority of rubber covered roof prism binoculars, these have slightly raised and more roughly textured areas instead where you place your thumbs when glassing, which perform the same function, by encouraging you to hold them correctly in the right place to achieve a perfect balance, for a nice stable, shake free image. One feature of the body that was immediately noticeable to me was just how shallow the objective lenses are set within the ends of the barrels on the Celestron Nature DX 8x42 binoculars. Most 42mm bins that I have tested tend to have the lenses positioned at around 8mm to 10mm from the end of the barrels, but these are only about 4mm. This more prominent position means that they are less protected from you accidentally touching them, scratching them against a branch or even just from dust or rain drops. I have also read that just like a photographers lens hood, the overhang of the outer barrels can help prevent lens flair, but I have to say that even though I was looking for it, I never observed any "flaring" of the image whilst testing these Celestron binoculars. These Celestron's can easily be mounted on a tripod. To do this you just unscrew the small circular cap located on the front face of the central hinge, which reveals a the standard �-inch threading that most binocular tripod adapters (not included) will screw into. This adapter can then be attached to your tripod. It was not that long ago that a sealed housing was a bit of a novelty and the reserve of the elite, but now most, including these Nature DX binoculars are fully waterproof. 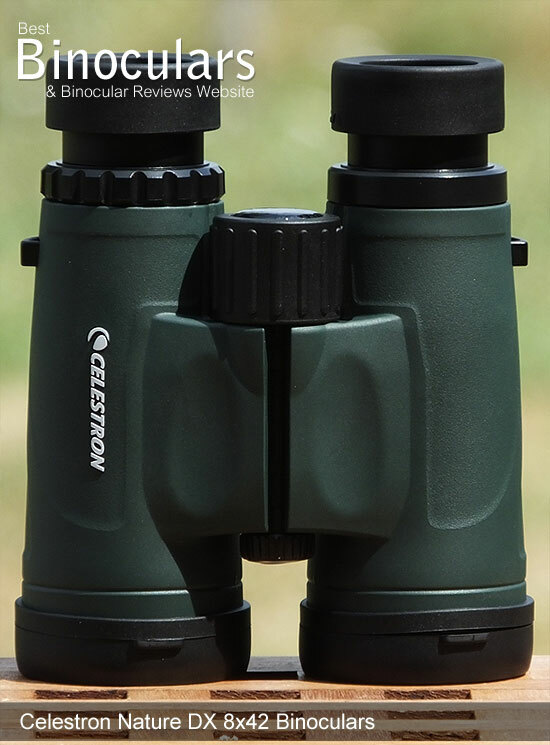 Celestron do not mention as to what depth or what standard of waterproofing they have, but I am sure that it will be sufficient to protect them from moisture or dust getting inside during normal use. During the sealing process they are also purged of air, which is then replaced with dry nitrogen gas that prevents the internal optics from misting or fogging up when you get rapid hinges in temperature (like when you walk inside from an early morning walk in winter). Because there is now no moisture or air inside them, it will also help prolong the life of the instrument by preventing corrosion and any fungal type growth on the inside of the lenses and prisms that that you sometimes find, especially on old binoculars. With an external diameter of 40mm the eyecups are perhaps a fraction smaller than the majority of others that I have measured within this class. However because they are covered in a fairly thick and soft rubber and are 6mm wide at at the part that you push against your face, they are as comfortable as any out there. Unlike the best that use a metal, the eyecup housing looks to be manufactured from a type of plastic, which to be fair is what you almost always find within this price category. They also feel very sturdy and the twist-up mechanism works nice and smoothly without any unwanted play. At 17.5mm, you get a good amount of eye-relief that should be enough for eyeglass wearers to use these optics with your glasses on and with one intermediate fixed stop and just enough resistance to movement to position and keep them in any position, you have enough flexibility to get them positioned correctly to achieve the full field of view. By opening and closing the central hinge you can adjust the distance between the centers of the ocular lenses from a minimum of 5.6cm to a maximum of 7.4cm. This inter-pupillary distance range is good and their minimum is on a par with some of the best full sized roof prism binoculars that I have used and so will suite those with closer set eyes. The focus wheel has a diameter of 29mm, which like the overall dimensions is on the smaller size for a 42mm binocular, but it is ridged, with a soft rubber covering and turns smoothly with just the right amount of resistance to movement to prevent unwanted movement and so I found it simple enough to turn and focus accurately, even with my thick winter gloves on. To take the focus from the extremes of near to far, requires two complete revolutions of the wheel (720°) which means I therefore describe these as having a low geared focussing mechanism. This is neither good or bad, it just means that it will take a little more time to change the focus over longer distances, but has the advantage in that it makes fine tuning your focus that much easier. Located on the right barrel, near the eye-piece, the diopter adjustment ring is fairly common for a roof prism binocular in this class. I say this because it is not lockable and does not have any fine click-stops like those found on some of the best, but also usually far more expensive bins. It does however turn smoothly and with just enough friction to prevent too much unwanted accidental movement. I would have liked to have seen a scale or at least more markings than just the neutral point and the + and - signs, because if your personal setting is different to these, you will have to re-calibrate them every time it is moved, be that accidentally or when sharing your bins. A way around this would be to obviously make your own mark, but you really shouldn't have to. As I took them out of their box, one aspect that struck me immediately was just how compact they looked. Indeed, I quickly had to recheck the markings just to make sure that I hadn't been sent a 32mm version by mistake! So what are the facts, well the official advertised length, which is achieved by removing the lens covers and twisting in the eyecups is 5.3in (13.5cm). As you can see from some of the examples in the table below this length is quite a bit shorter than almost all other 42mm binoculars that I have tested. Twisting out the eye-cups, their length moves out to 5.6in (14.2cm) and then by adding both the ocular and objective lens covers the maximum length is 5.7in (14.6cm). By fully opening their central hinge, their official width is 4.9in (12.4cm) and their height is 2in (5.2cm), which once again places them along with the narrowest and shallowest 42mm binoculars. For interest, if you close the central hinge, their width drops to 4.2in (10.7cm) and their height rises to 2.6in (6.5cm). 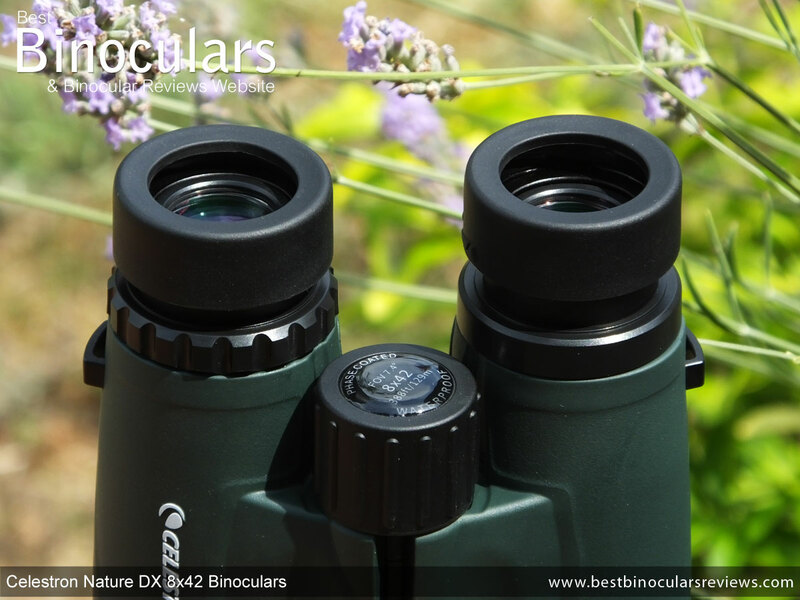 Thus for a full-sized 42mm binocular, these are really compact and therefore are ideal if you have smaller hands or if size is important to you, but you don't want to sacrifice the light gathering potential by opting for a smaller aperture binocular. Weighing only 22.2ozs (629g) they are not only compact, but very lightweight as well and one of the lightest in this size class that I have ever used. 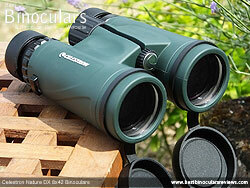 This is also highlighted by comparing them to other 8x42 binoculars in the table above. I guess the smaller dimensions help to keep the weight down, as well as the lightweight polycarbonate chassis. Sometimes a really lightweight binocular can feel a little cheap and fragile, however I must stress that even though they are actually relatively cheap, these Celestron's don't look or even feel it. In fact it is quite the opposite and whilst they may not match the build quality of a very high end pair of optics with a magnesium housing, they definitely look and feel much more expensive than what they actually are, which is impressive. 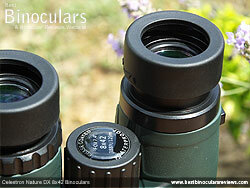 Other than measuring their diameter to 21mm, which is a millimeter or so smaller than what I usually find on 8x42mm binoculars, I could not find any more information as to the exact design or how many elements are used in the ocular lenses. Like the eyepiece lenses, Celestron do not go into detail on the exact make up of what will be a compound lens that uses more than one lens element to reduce optical aberrations. What I can say is the 42mm diameter objective lenses used on these is the most common size used on full sized binoculars as they tend to strike a good balance between, size, weight, cost and light gathering potential. Combined with the 8x magnification these and indeed all other 8x42 binoculars produce an exit-pupil that is 5.25mm in diameter (42 ÷ 8 = 5.25), which basically means that other than in very, very, bad light, when the pupils in your eyes dilate to larger than this size, they will provide your eyes with more than enough light to produce a nice bright image. This relatively large exit pupil also makes it much easier to line up your eyes with the shaft of light exiting the eyepiece, which in turn makes it much simpler to use the binoculars and not get dark rings forming around the edges of the view. 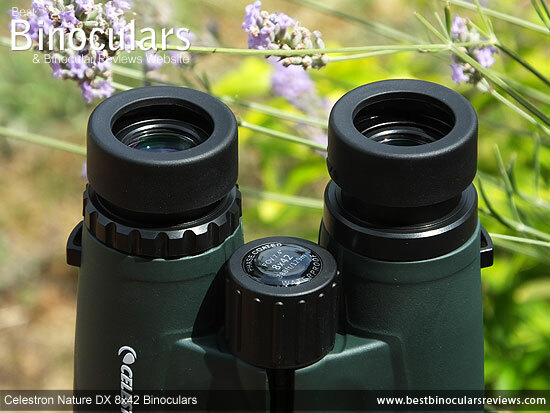 The Celestron Nature DX binoculars use roof prisms made from BaK-4 glass, which is generally considered the preferred option than the BK-7 prisms that you also often see used within this price range. 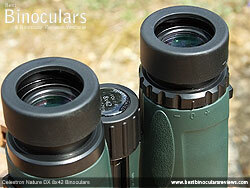 Modern binoculars have approximately 10 to 18 separate glass surfaces, with each one having the potential to disrupt or reflect the light in an unwanted way, that left unchecked will result in a less bright and lower quality image. 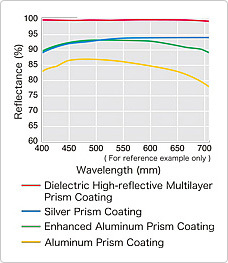 So to correct and reduce this, special optical coatings are added to these surfaces that are designed to either reduce the amount of internal light loss and glare or better direct the wavelengths of light that can make a huge positive difference to the image that you see. Usually made from magnesium fluoride or calcium fluoride, it is these coatings that produce a slightly brown, green or blue tint that you see on the surface of the lens. They work by interfering with certain wavelengths or colors of light and either limit or completely eliminate their reflection. Whilst almost all modern binoculars use some form of coating(s) on a few, most or all of the optical elements, depending on their quality and the amount that the manufacturer wants to spend, they have different amounts and qualities of these coatings. Many binoculars in this price range will be described as "Multi-Coated" or even just "Coated" meaning that only some of their optical elements have multiple layers or just a single layer of these coatings. However the Celestron Nature DX is describe as being "Fully Multi-Coated", which is great as it means all the glass surfaces have received multiple layers of these anti-reflection coatings which should result in them transmitting about 90-95% of the light to produce a bright image that is also sharp and with good contrast. One of the surfaces on the roof prism design does not reflect all that light that hits it, meaning that left unchecked, the transmittance levels of the optical system will will be reduced. To improve this, most higher quality roof prism bins have single or multi-layer coatings of a highly reflective material added to this surface. Celestron unfortunately don't go into details as to what they use, but considering their price and the fact that they don't shout about it we can safely assume that it is not a dielectric coating. Celestron do state that they have added phase correction coatings to the prisms on the Nature DX, which are designed to improve image sharpness by counteracting "phase shift" that occurs in the roof prism design. 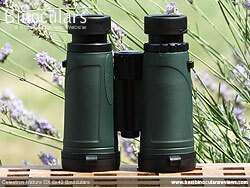 This is great to see as it is not something that I often find added to binoculars in this price range. I measured the closest distance I could focus on an object as being 6.7ft (2.05m) on the pair I was testing, whilst their advertised minimum close focus is 6.5ft (1.98m). Whichever the case, this is still very good and should be near enough for occasionally observing insects like butterflies, or flowers from a fairly close range. With 17.5mm of eye-relief, I describe these as having long eye-relief and it should easily be enough room for most people, including those who wear glasses to position the eyecups at the right distance to achieve the full view without any dark rings forming on the edges. Judging the quality of the image quality is by far the hardest part for me when reviewing binoculars as quite often the differences between binoculars can be so small that they are almost imperceptible. So to keep my opinions as consistent and as objective as possible I compare the view through the bin under review with a number of my benchmark binoculars and so am able to rate them accordingly. I thought that the colors were possibly a little less vivid than that of my high end controls, but this is was only very, very minor and really hard to be sure about. What is more important is that the colors look natural, without the artificial tints that you can sometimes see, especially through cheap binoculars. The amount of contrast was in my opinion no different to that of my controls in good light. In poor light, I did think that my high end benchmarks had a slightly better contrasting image, but this may just be down to them also having a slightly brighter image (see below). As we have already discussed, the 8x42 setup makes for a good all-round binocular that should produce a nice bright image under most good and even poor light conditions. The optical coatings used will also help to ensure that as much of the potential light gathered actually gets through to your eyes. As expected in good light, I was unable to detect any difference in the brightness of the image between these Celestron binoculars and that of my mid-level and very high level 8x42 benchmark bins. This is mostly due to the fact that in good light the 5.25mm exit pupil of all 8x42's (42 ÷ 8 = 5.25) is larger than that of your pupils and so they are providing your eyes with more light than they actually need and so they all tend to appear to be as bright as each other. If you wish to understand more on this subject, please take a little time to read my guide to image brightness and the exit-pupil. In poor and very light I was impressed to see that the brightness was at least the same as my mid-level 8x42 control and whilst I did notice a difference in brightness between these and my very high quality 8x42 controls, it was only a small amount. Thus, I would rate the image brightness of the 8x42 Celestron Nature DX as being good to very good, which considering their price point is very impressive and as good as the best in this class. Color fringing caused by chromatic aberration is observable, but the amount is minimal and you only notice it when you really look hard for it by focusing right on the edges of objects that have a high contrast with their background. Whilst this amount as more than my high lever benchmark, it is no more than I would expect from any other binocular in this class. One of the strongest aspects of the image produced by the Celestron 8x42 Nature DX, is that it looks nice and flat from the center of the view until fairly close to the edges and their is only a small amount of softening right at the edge of the view. This amount is less than what I would expect of most in this price range. Comparing the distances that you can recede from a fixed point about 5 meters away and still have the image in focus without moving the focus wheel is the method I use to judge the depth of field. They were very close to that of my 8x42 control, and so I would rate them as about average in this area. To sum up, the image produced by the Celestron 8x42 Nature DX is better than most in the low cost range and I would say as good as most mid priced binoculars. For interest and just so that you can make some quick comparisons, I have included the main specs and features of this Celestron binocular with that of a range of other 8x42 binoculars that I have recently reviewed. As you can see most on the list above, apart from the "standard" Celestron Nature's are far more expensive than these, yet they still compete very well in most areas and what really stands out to me is just how small and light they are for an 8x42. Whilst it may not match the very best in terms of overall quality, the included soft carry case is better than those that come with most other low cost binoculars I have reviewed. The padding is fairly light, but the binoculars fit snugly inside, but not too tightly. They can be stored with the central hinge fully open and the lid easily closes and fastens with the eyecups extended and the lens covers attached. Sadly this is not always the case! Inside there is also a separate pocket located on front face that is an ideal place to store a few small items like a lens cleaning cloth. The lid folds over the top of the case and is held shut with a strip of Velcro. This works fine, but you just need to keep in mind that the noise made when rapidly opening them could frighten away that once in a lifetime sighting in the tree next to you! The case comes with it's own, rather simple un-padded strap, the length of which can be adjusted with a slider, but it cannot be removed completely from the case unless you were to cut it! On the rear of the bag there is a large loop that you can thread your belt through, should you wish to carry it on your hip. Without any padding and only 2.5cm wide, the 1mm thick nylon neck strap works ok, but is probably the weakest aspect of these Nature DX binoculars. But having said that, so are those of many others in the low cost category and I guess this is one area where manufacturers have to cut costs to keep the price down. So whilst I would have liked to have seen a better neck strap, if it meant that they had to sacrifice the image quality by removing some coatings for example, I would opt for this neck strap every day of the week. Made from a soft, flexible rubber, the objective lens covers have a loop attached to them that you use to keep them tethered to the ends of the barrels, meaning that you don't have to keep taking them the case out and putting them away ever time you use your bins. The actual covers fit very well over the ends of each of the barrels and are simple to put on and take away, but should not fall of accidentally. Also made from what looks like the same soft, flexible rubber, the ocular lens covers or the rain-guard as it is sometimes called also fit perfectly over the eyecups. It also has a flexible bridge spanning the two cups that enable you to fit them to the eyecups no matter what position central hinge is set at. A loop on the end of each cup is there for you to thread the neck strap through to keep the rainguard handy at all times should you wish. The supplied lens cloth is of a good quality and ideal for basic cleaning, but for better results and to be sure that you don't damage any of the exterior coatings on the lenses, you should consider investing in a full optical cleaning kit. 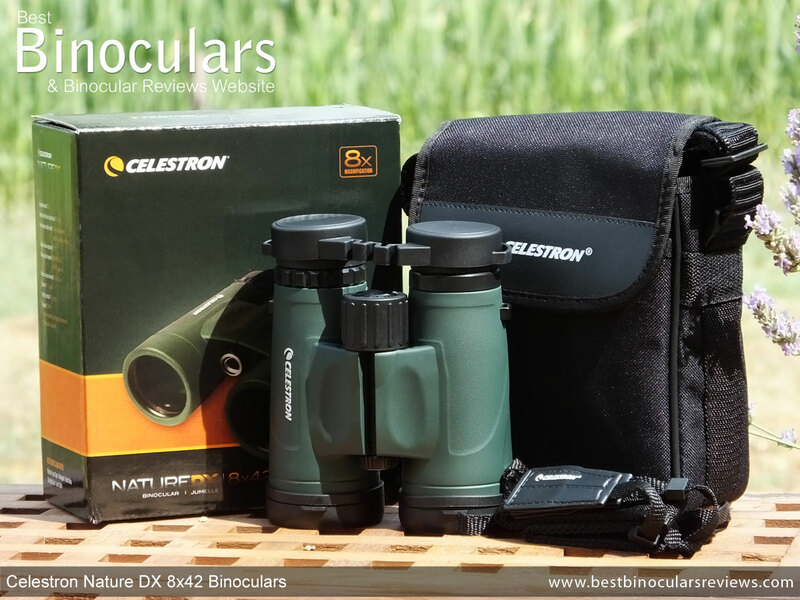 Celestron also include a Nature DX instruction booklet that includes details on the parts of the binocular, adjusting the interpupillary distance, setting the diopter, eyecup adjustment, attaching a tripod as well as basic cleaning and storage in a number of different languages. Also included with my set were details of the US and Canadian limited lifetime warranty and the UK 10 year guarantee. Strong Points: The overall build quality is very good for a binocular in this price range add to this the compact dimensions, it makes for a well balance, lightweight, but solid instrument that looks and feels far more expensive than it actually is. I guess another strong point is that the actual binocular does not have any major weaknesses or shortcomings. The brightness and quality of the image produced is very good in comparison to most others in this class and they have a field of view that is better than many 8x42's way more costly than these. 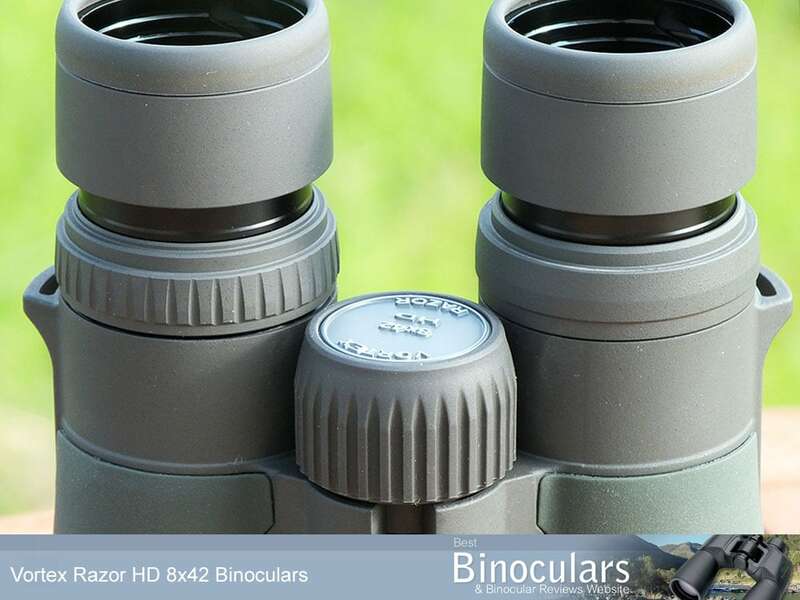 This combined with plenty of eye-relief and a good minimum focusing distance make for a good all round binocular that should be within reach of most people budgets. Weak points? The quality of the extras like the neck strap and to a lesser extent, the carry case do not match that of the actual binocular, but to be fair to Celestron, they are about as good as most others in this price range. I guess, to produce a binocular that costs as little as these, you have to make compromises somewhere and if I had the choice, I would rather see them cut costs with their accessories and keep the quality of the actual instrument as high as possible, than the other way round, which is exactly what Celestron have done with the Nature DX. 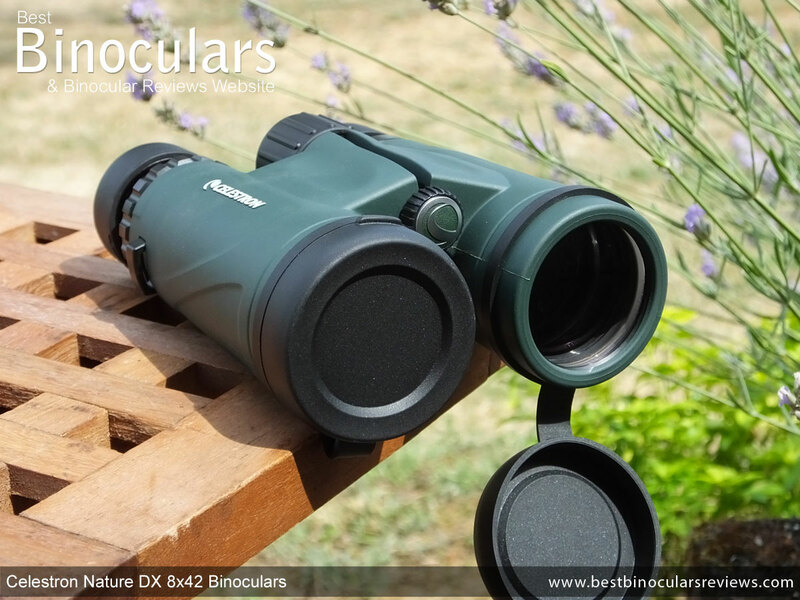 Absolutely - within this low cost price range, these binoculars needed to achieve a score of more than 70% on the BBR scale to be considered, which as you can see below they easily achieved. 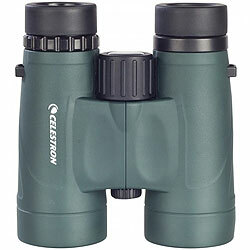 This means that for the price and compared to others in this class these Celestron binoculars are made to a high standard and have a optical performance that is well above average and which is why I believe are one of the Best Value for Low Cost binoculars that I have tested. Ideal For: Their relatively compact dimensions and lightweight design, combined with a good minimum inter-pupillary distance (IPD) make these ideal for those with smaller hands and faces, like older children or women. That is not to say that larger people wont also find these comfortable as they have a good IPD range that should accommodate most people. This relatively compact design will also make them a great choice for those who don't want to sacrifice the light gathering potential of a 42mm full sized binocular, but want an inexpensive one to travel with or to take camping, hiking or even to an outdoor sporting event. 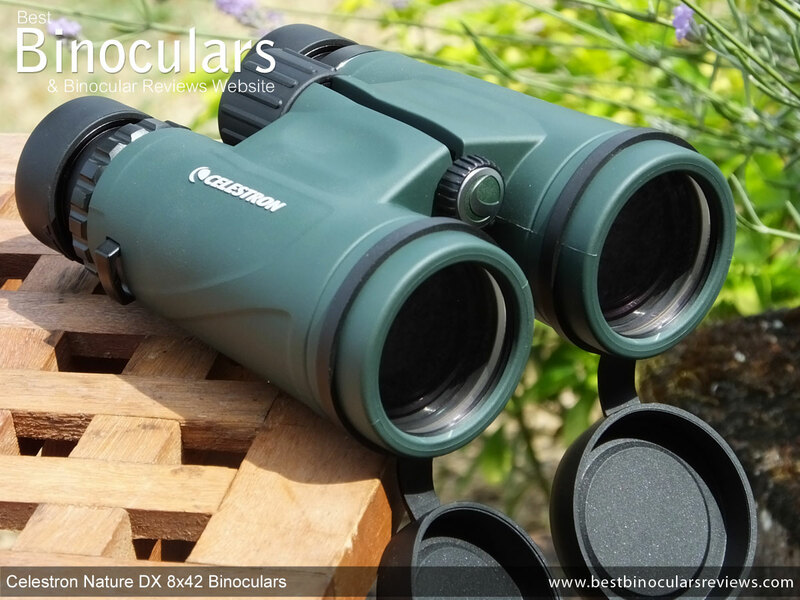 The low price combined with a good FOV, high quality as well as bright, image, makes these in my opinion ideal entry to mid-level binoculars perfect for general use, most types of wildlife observation and in particular bird watching. Whilst the tough, waterproof and unreflective body should also appeal to those looking for inexpensive hunting binoculars. Many thanks to Hama (UK) Ltd, the UK distributor of Celestron binoculars for arranging for these Nature DX Binoculars to get to me to review. This Celestron Nature DX 8x42 binocular review, like all the others that I have written on BBR is my honest own opinion of the product and I have not been swayed in anyway to write the review in a certain way. Whilst I spend a lot of time researching every product I write about to tray and ensure all the facts and figures are to the best of my knowledge correct, I have been known to make the occasional mistake, so if you spot any please feel free to let me know. Unlike many bogus reviews on the web written by people who have never actually used the binocular, I also take time to fully test and use each binocular I review, both in my office and out in the field.